A small Chinese vase that was valued at between £10,000 and £15,000 has been sold at auction for almost £1m. The extremely rare 18th Century ornament, made for a Chinese emperor, was brought to Britain by the seller's family more than a century ago. It had been kept in a house in North Yorkshire for 45 years and the owner had no idea how valuable it was. It was sold for £950,000 to a telephone buyer from China at Tennants' auctions rooms in Leyburn, North Yorkshire. 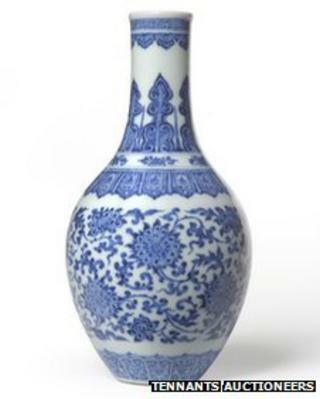 Nigel Smith, Tennants' associate director, said the blue and white vase was made for the Qianlong Emperor around 1730. He said the high price was down to its rarity and exclusivity as very few were produced. "It really is a museum-quality piece and these things very rarely come on the market. "It's come down through the family. One of their relatives was a diplomat in China in the 1880s and was given it as a gift." The seller's grandmother, Lady Ethel Margaret Stronge, left the vase to his mother Mrs Rose Ethel Richardson of Tynan Abbey, County Armagh, Northern Ireland, who gave it to her son. Lady Ethel married Sir Francis Stronge who joined the diplomatic service in London in 1879 and served in Peking the same year. He went on to serve in the Supreme Court in Shanghai in 1885 before working in Central America. The vase was discovered by Rodney Tennant, from the auction house, during a routine house call to value the contents.